I would like to know why the following comment was deleted from your pages. How does it violate community standards? The comment is more fair and better written than the Cohen article it references. As a Guardian reader, this comment reflects my observations of Guardian's coverage of Assange and Wikileaks. Please reply with an explanation of exactly what the problem is with my comment that you felt the need to delete it. The Guardian has viciously & relentlessly attacked ‪#Wikileaks and conducted character assassination of Julian Assange for years. The Guardian gave space to Nick Cohen just a few weeks ago (and James Ball himself promoted that awful smear as "astute & wise" on social media) for a condescending, vitriol-filled smear of Assange and Assange/Wikileaks supporters ( http://www.guardian.co.uk/commentisfree/2012/jun/24/nick-cohen-julian-assange-paranoia) . This new positioning via James is reminiscent of tactics often used by right wing political parties, where one party makes completely outrageous claims and strawman arguments, subsequently blames the other party for protesting and defending themselves against those claims then goes on later to say we should "move on", "compromise" and find some non-existent "middle-ground". What middle ground? The mudslinging and disinformation campaign has been carried out by you and directed towards Wikileaks and Assange. What you need to do, Guardian, is apologise and correct the false narrative you have built through misinformation, disinformation and omission. Then, we can "move on". You might even get some of your readership back. In the evening, I wrote a new comment. Comment 2 was also deleted. 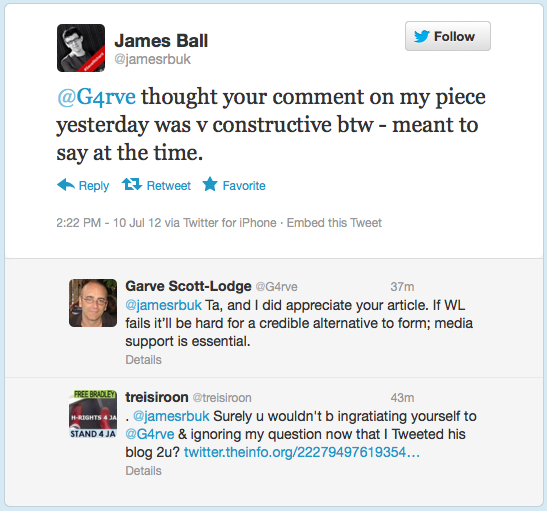 "It was just 2 weeks ago that James Ball endorsed on Twitter as "astute and wise" the Nick Cohen piece entitled "Definition of paranoia: supporters of Julian Assange"
Ball and other Guardian writers have consistently ignored important parts of the Assange and Wikileaks story- including that Sweden has refused to use standard procedures like mutual legal assistance, to bring closure to Assange's case in Sweden (but Ball has lamented that the delay in the case being brought to closure is Assange's fault). The repeated mis- and half truths have significantly affected public understanding of facts of the Assange-Sweden case and understanding of the threat of the Wikileaks Grand Jury to Assange's (and others') wellbeing. Guardian has made fun of Assange's legitimate concerns, including death threats and the real risk of extradition to the US. Guardian is one of the many papers that has written countless stories about Assange (most of them negative) while hand-wringing that it is Assange's fault and such a tragedy that Assange, rather than Wikileaks "has become the story". Repeated articles saying Assange is "charged", steering of public opinion by omission of facts and using leading language have been hallmarks of Guardian's coverage of Assange and Wikileaks. 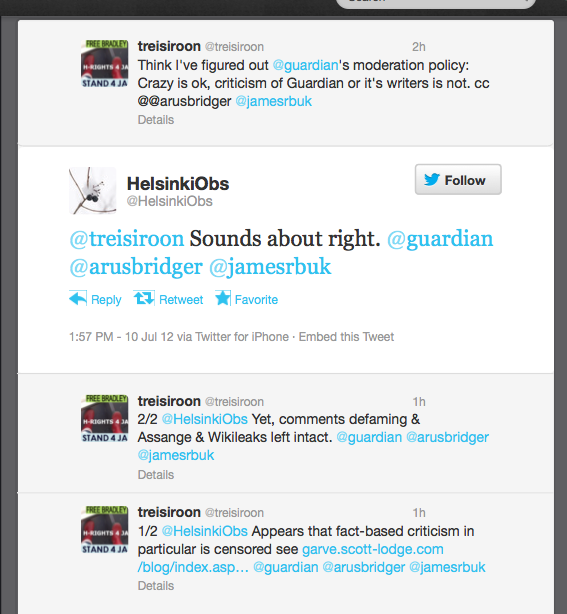 If you, James Ball and Guardian, have changed your tune on Assange and Wikileaks, that's great. It's also quite a turnaround from 2 weeks ago when you called Nick Cohen's piece "astute and wise"." The comment was deleted. I wrote another one pointing out the same facts. It was deleted without so much as a mention. I would like to know why my comment, my first ever to a Guardian article, and which received a relatively large number of recommendations, was removed from your site. I do not see how it breaches "community standards".. The comment was certainly critical. It was also a legitimate criticism. Thank you for a personal response directed exactly to this comment and how it breached community standards to the extent your moderator found it necessary to remove the comment. Thank you, treisiroon. Thanks for your email. Your post was removed because it contained elements which were deemed legally risky. Thank you for your reply. Can you clarify in what way my post might be "legally risky"? I discussed aspects of the case, but they are publicly known facts of the case, based entirely on the publicly available minutes of the police interviews. 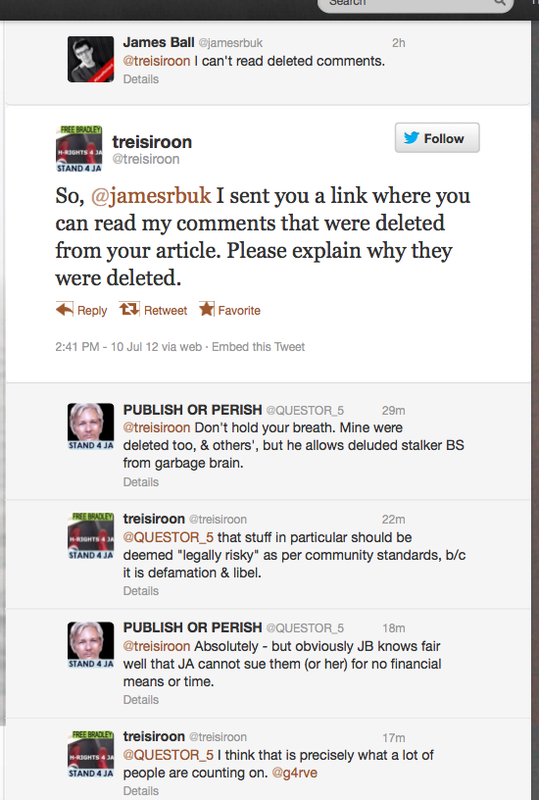 They were neither libelous nor defamatory. I said that the women in question went to the police, 1 to compel Assange to take an HIV test and the other "for support" and that the policewoman on duty determined that a crime had been committed. True or false? Well, the women state these reasons themselves, according to the minutes of police interviews. I pointed out that the case of Assange was dismissed once by a senior prosecutor and then resurrected by a politician-lawyer. True or false? True. Eva Finne, prosecutor for Stockholm district, dismissed the case. and Claes Borgström, who is a politician and lawyer, then complained about that dismissal to Marianne Ny, a more senior prosecutor. 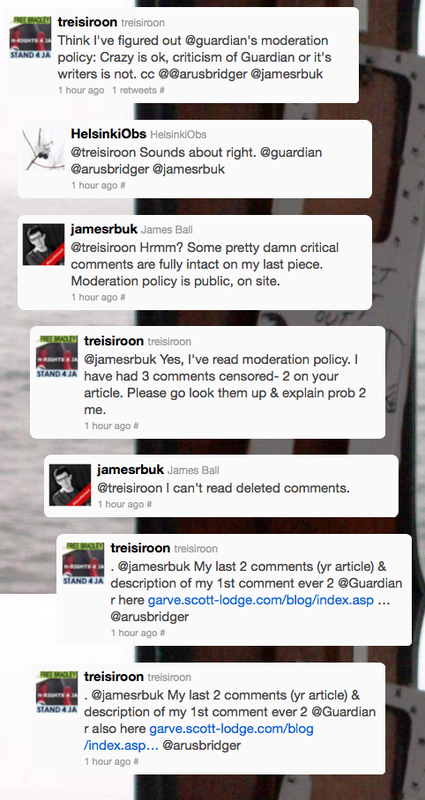 So, please tell me what I said that resulted in the deletion of the comment from your website. If it was not one of these two statements, was it then something else? With limited experience of the Guardian comments section, I am trying to understand why my comments were censored. I remind him I’ve sent him something to look at. So actually not true then. The case was opened by a on-call prosecutor, dismissed by Eva Finne, senior prosecutor. This dismissal was appealled by the lawyer representing the two women and reopened by Marianne Ny, even more senior prosecutor. This of course is evidence of the strong legal situation in Sweden, were decisions made by authorities can be appealed. You post does show something interesting, that you don't understand the Swedish justice system and that Swedish prosecutors have: An absolute duty to prosecute. Absolut åtalsplikt. This means that it's a prosecutors duty to investigate potential crimes and do everything within their power to bring criminals to justice. This has the consequense of victims not being able to withdraw any accusations, which is another telling sign about the strong and safe legal situation in Sweden.